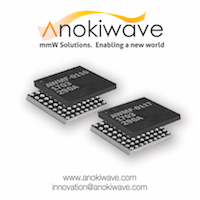 Anokiwave is introducing its first Intelligent Gain Block™ ICs in a new family of mmWave multi-market solutions. San Diego CA, 17 April, 2018: Anokiwave is redefining traditional single function gain blocks with its new family of multi-function microwave and millimeter-wave Silicon ICs, offering complete transmit/receive functionality with active gain and phase control. The new IC family offers versatile RF blocks that can be used in wide range of applications including SATCOM, RADAR, 5G communications, and sensing. The AWMF-0117 and AWMF-0116 provide a PA, LNA, 6-bit gain and phase control and a T/R switch, all integrated into single IC in Ku and Ka-bands. The AWMF-0117 operates from 10.5 GHz to 16.0 GHz providing +12 dBm power output during transmit and 3.0 dB noise figure during receive. The AWMF-0116 operates from 26.0 GHz to 30.0 GHz with +12 dBm of power output during transmit and 6.0 dB noise figure during receive. Both ICs provide 31.5 dB of dynamic range and are packaged in a 2.5 mm x 2.5 mm WLCSP. Anokiwave offers evaluation kits for ease of adoption of the technology and capabilities. The kits include boards with the IC, USB-SPI interface module with drivers, and all required cables. Pilot production deliveries are available now.